A men’s cologne is a delicate thing. Too fragrant and it might come across as feminine, too weak and what’s the bloody point in wearing it at all. When it comes to finding the right cologne you might need to do a bit of searching. 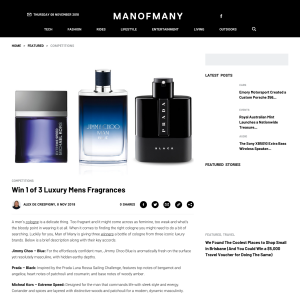 Luckily for you, Man of Many is giving three winners a bottle of cologne from three iconic luxury brands. Below is a brief description along with their key accords. Jimmy Choo – Blue: For the effortlessly confident man, Jimmy Choo Blue is aromatically fresh on the surface yet resolutely masculine, with hidden earthy depths. Prada – Black: Inspired by the Prada Luna Rossa Sailing Challenge, features top notes of bergamot and angelica; heart notes of patchouli and coumarin; and base notes of woody amber. Micheal Kors – Extreme Speed: Designed for the man that commands life with sleek style and energy. Coriander and spices are layered with distinctive woods and patchouli for a modern, dynamic masculinity. To enter to win one of these 3 fragrances, simply fill out the competition form below. The competition is open to entrants from 8AM 8th of November 2018 to 11:59pm 20th of November 2018. Employees and the relatives of employees of Man of Many are excluded from entering. Total retail prize value differs for each of the 3 fragrances. The prize is as follows: Win 1 of 3 Luxury Men's Fragrances. Three major prize winners will each receive a 100ml Luxury Fragrance for Men. Prizes must be claimed by 4th of December 2018. In the event a winner does not take the prize by the time stipulated, then the entire prize will be forfeited by the winner.